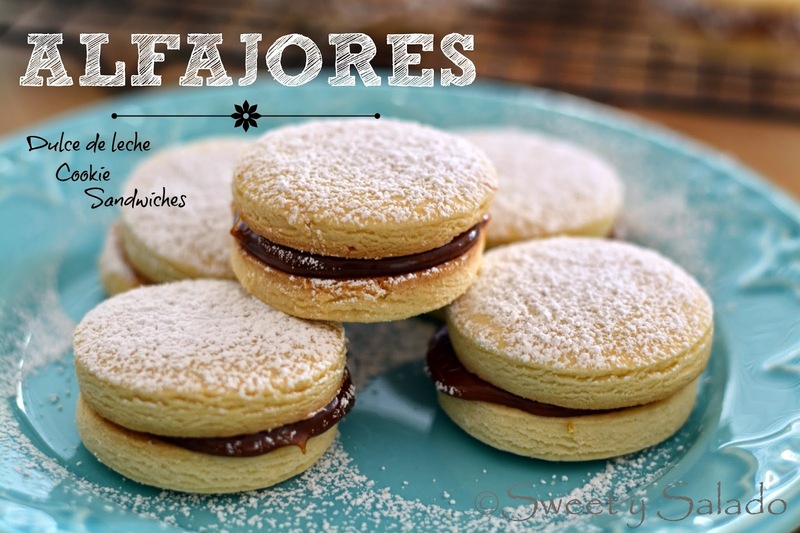 Alfajores is another recipe that is so popular all over Latin America that many people think they are an original recipe from their native country. Truth is, nobody really knows where these arequipe or dulce de leche cookie sandwiches are actually from, but most people believe they were brought over by the Spaniards and their popularity spread all over Latin America. The key ingredients that make this recipe so special and unique are cornstarch and arequipe (dulce de leche). I have to warn you that getting the perfect dough consistency may not be an easy task for some people, but as always, practice makes perfect. The problem is that using the cornstarch makes the dough very dry, which was a huge issue for me the first time I made them. However, I fixed that little problem by adding a bit more butter and a couple more egg yolks to get a smooth dough that was easy to work with. As I mentioned before, the arequipe is essential in this recipe and you can get it at any grocery store that sells Latin American products, or you can make it at home by following my recipe clicking here. Using grated coconut to decorate them is also optional and you don’t have to use it if you don’t want to. Another option would be to decorate them with confectioner’s sugar or not decorate them at all. 1. In a large bowl combine the all purpose flour, cornstarch, baking powder and baking soda. Whisk well and set aside. 2. In a large mixing bowl, cream butter and sugar on low speed until light and fluffy, about 2 minutes. Add the egg yolks one at a time, then add the lemon zest, vanilla extract and cognac. Then slowly add the dry ingredients until you get a crumbly but workable dough. 3. Separate the dough in half, shape into squares or rectangles and wrap them with plastic wrap. Refrigerate for at least 1 hour. 4. Preheat oven to 350ºF (180ºC). 5. Place the refrigerated dough on a floured surface, flour a rolling pin and roll it out to about ¼ inch (.64 cm) thick. Cut the dough with a 2 inch (5 cm) round cookie cutter to make an even number of cookies. Place cookies ½ inch (2.54 cm) apart on a cookie sheet lined with parchment paper or a silicone baking mat and bake for about 10-13 minutes or until the underside has a light golden brown color. Let them rest for 1 minute on the cookie sheet and then let them cool completely on a cooling rack. 6. Spread 1 tsp of arequipe on the underside of half of the cookies and then place the rest of the cookies on top of the arequipe to make a sandwich. Press them lightly to squeeze out the arequipe and then roll the alfajores in the shredded coconut or dust lightly with the powdered sugar. I don't have cornstarch. What would be a good substitute, if possible? 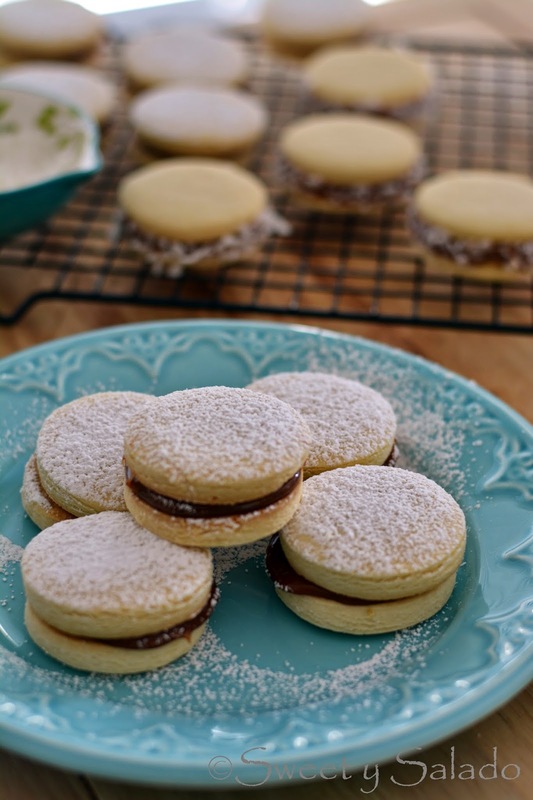 To make this recipe you need cornstarch because it's what gives the alfajores that unique texture. Cognac gives these cookies a very special flavor but if you don't it, you don't have to use it. Can I use rum or vodka as a substitute for the cognac? The cognac gives them a very special flavor, rum would also raise the level of flavor. But you can also skip the alcohol if you prefer. Do you know how to dry the dough if it is too wet right after mixing? If you measure the ingredients correctly, then you shouldn't have any issues with the texture. However, if for some reason you notices that it is not dry enough, you can slowly add flour little by little until you get a dryer consistency. Thanks for the awesome recipe. I had never heard of these before my friend brought some back from Argentina, and I was so curious to try and make them myself. I accidentally used whole wheat flour, which may have given it a more powdery texture. It still tasted great though!